This fall it is exactly 40 years since the first microprocessor saw the day of light. Intel has of course provided us with a press kit that we will make good use of, but complement it with additional information. Until the advent of the microprocessor the market was dominated by minicomputers and mainframes. They were distinguished as follows: The CPU of a microcomputer was a single chip, the CPU of a minicomputer took up an entire board of discrete components and the CPU of a mainframe took up at least a rack. The 4004 was a 4 bit processor clocking along at the amazing speed of 740kHz and was manufactured in 10 micron process technology. For those of you newcomers used to measuring process technology in nm this is equivalent of 10,000nm. The processor was primarily used in embedded electronics. 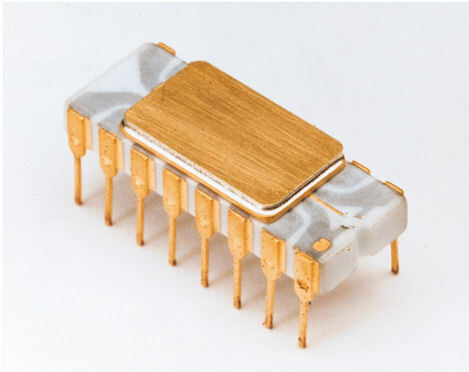 Intel 4004 microprocessor. Photo copyright Intel Corp.
It’s successor the Intel 8080 became a huge success – so huge in fact that it was copied and enhanced by Zilog under the name Z-80. Even Texas Instruments manufactured the 8080 under a license and called it the TMS8080. However, Intel was not the only player on the 8 bit market. Also Motorola was popular with its 6800 series, but probably most popular was the 6500 series from MOS designed by Chuck Peddle who had also designed the 6800 for Motorola. The 6500 became very popular due to the VIC-20 home computer. Intel marched on with its 16 bit processor; the 8086 that was not widely adopted, but the cost reduced version with an 8 bit bus known as the 8088 was chosen by IBM for the original Personal Computer. And the 8088 made Intel the dominant player that the company still is today. Motorola tried with its 68000 series that in many respects were far superior, but they lacked software and the same was the case with the Alpha processor. These days the PC market is totally dominated by AMD and Intel, but the mobile and embedded markets have given ARM and MIPS a place to grow. ARM is very much used in mobile phones and tablets, MIPS is used in tablets and in embedded electronics, although it can also be found in a number of Chinese smartphones. Since its inception the core frequency has gone up from 740kHz to just above 8GHz with some aggressive cooling. Stop and think about it: a million fold improvement in clock speed and all without the power budget going through the roof.